We know that due to upthrust, objects tend to lose weight when immersed in liquid. Archimedes principle states that "If an object is partially or completely immersed in the liquid, the weight of liquid displaced by the object is its upthrust". This law is applicable for the gaseous medium too.The weight of the displaced liquid = ρgv where ρ is density of the liquid, g is acceleration due to gravity and v is the volume of the displaced liquid. Law of flotation states that "The weight of the liquid displaced by a floating object is equal to its weight". When an object sinks it displaces liquid, as it is sinking the amount of water displaced increases (Archimedes principle) until it displaces liquid as much as its weight. If the object displaces liquid equals to its weight the object floats if it cannot then the object sinks. If a wooden cork is subjected to the water, the water displaced by the cork is very less but is equal to its weight. So it easily floats in water. If a rubber cork is subjected to water then the water displaced by the rubber cork is larger as its weight is also greater than wooden cork. So it also floats. But if we use the cork made by stone it sinks because it cannot displace water equal to its weight. This is also called Nicolson hydrometer because it was invented by him. In this hydrometer, a metallic rod with a mark on it connected is a pan as shown in figure. At the lowest part, a heavy cone filled with lead is connected to help it remain vertically inside liquid. This instrument is used to measure relative density of liquids. To measure relative density of a liquid, it is kept in the liquid and by adding weights in its pan the mark on the rod is managed to bring at the surface of the liquid. On the basis of the amount of weight required to maintain the level, relative density of the liquid is analyzed. It consists of a hollow cylindrical glass build. Its lower portion is filled with lead shots and they are fixed in the position using sealing wax. The cylindrical bulb is heavy helps the hydrometer to float in a liquid vertically. A graduated stem is at the top. The stem is made narrow for greater sensitivity. 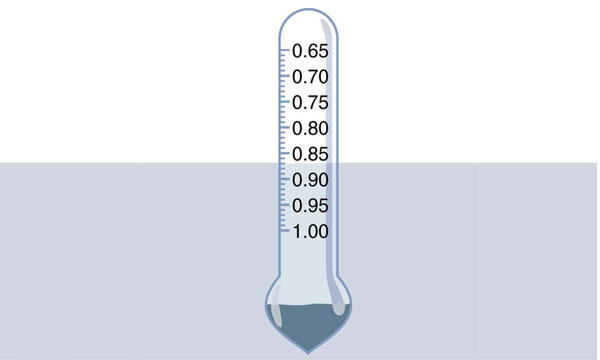 When a hydrometer is placed in a liquid, it sinks until it displaces the liquid which is equal to its own weight. The stem is graduated in kg/m3 to give the value of density and sinks more in the liquids having less density. Thus, the constant weight hydrometer measures the density of liquid directly without calculation. A specially designed constant weight hydrometer used to test the purity of milk is known as lactometer. Archimedes principle states that "If an object is partially or completely immersed in the liquid, the weight of liquid displaced by the object is its upthrust". Law of flotation states that "the weight of the liquid displaced by a floating object is equal to its weight". Hydrometer is the instrument used to measure specific gravity of the liquids. A specially designed constant weight hydrometer used to test the purity of milk is known as lactometer. The balloon filled with hydrogen gas rises to a certain height and then stops rising further. Why? The balloon filled with hydrogen is rising because the weight of the balloon filled with hydrogen is less than the weight of air displaced by it i.e. upthrust of the atmosphere is acting on the balloon. As we go up in the atmosphere the density of air decreases that leads to decrease in the weight of displaced air i.e. decrease in the upthrust. As the weight of the hydrogen balloon is same to the weight of air displaced by it, it stops to rise. An iron ball sinks in water but floats in mercury, why? Specific density of iron is higher than that of water and less then that of mercury. Being denser than water it sinks in water but is less denser than mercury so it floats in mercury. The weight of an object is lighter in water than in air, why? The upthrust provided by a medium is directly proportional to the density of the medium i.e. more the density more is the upthrust. Water is denser than air so upthrust provided by water is higher than that of air. So , having more upthrust in water means the object looses some of its weight than in air. So, due to that loss in the weight, the object is lighter in water than in air. A person can lift a heavy stone immersed in water easily as compaired to air, why? The upthrust provided by a medium is directly proportional to the density of the medium i.e. more the density more is the upthrust. Water is denser than air so upthrust provided by water is higher than that of air. So, we are getting extra lift from below when the object is in water than it was in air. So, due to that extra push a person can lift a heavy stone immersed in water easily as compaired to air . Why it is easier to swim in salty water (sea water) than in pure water (river water)? The density of salty water is higher than that of pure water and according to upthrust formula medium having higher density will provide higher upthrust (Upthrust is directly proportional to the density of the medium). So, salt water will push the swimmer body upward with more force than that of pure water. Due to that extra push by salty water it is easier to swim in salty water than in pure water. Archimedes' principle states that, "When an object is fully or partially immersed in liquid substance, the weight of the displaced liquid is equal to the upthrust of the liquid on the object". "An object that floats on a liquid medium displaces the liquid equal to its weight". If a piece of wood having a total number of 1.6m3 and density of 800kgm-3 floats on water of density 1000kgm-3, calculate what part of the wood is in water. The mass of a brick is 2kg Find the mass of water displaced by it when it is completely immersed in water. (Density of the brick is 2.5g/ cm3). ∴ Mass of the displaced water is 0.8 kg. Mass of water displaced = (m2) = ? Hence, the water pressure exerted at the bottom of the tank is 58800 Pascal. The buoyant force on a body immersed in a fluid is equal to the weight of the fluid displaced by that object is ______. Which one is also called Nicolson hydrometer? 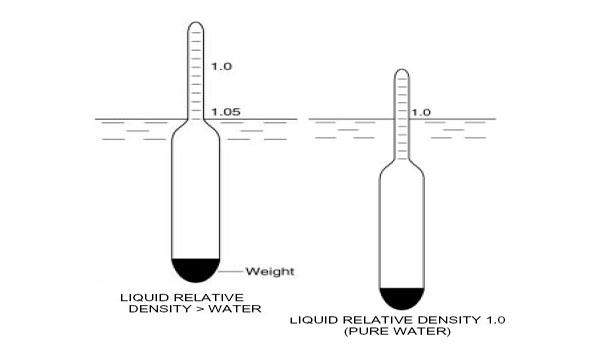 Which instrument is used to measure relative density of liquids? which instrument used to measure specific gravity of the liquids? Archimedes principle law is applicable for the ______. Any Questions on 'Archimedes Principle '?